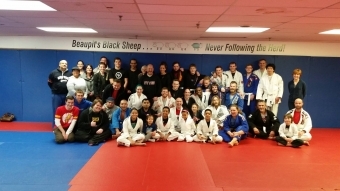 Last Thursday night I had the privilege to award some of my students their first stripes on their white belt. For those that don't understand the ranking system in Brazilian Jiu Jitsu, you start at white belt, then work towards blue, purple, brown and then black. Between each of those belts are stripes that get placed on the belt, up to 4 stripes. So you can see that stripes on a white belt are really the first promotion someone will receive, and they will mean different things to different people. For everyone that receives their stripes, it is a recognition of progress on the mats of their skill. For some, receiving a stripe on their belt has more of an affect for them for who they are off the mats, and I experienced this today from one of my students. He has allowed me to share this with everyone, and I thank him for that because it truly represents the power of Brazilian Jiu Jitsu, and the strength of the SBG "tribe". "Hey coach I just thought I'd let you know that stripe helped me far beyond the mats I was dealing with a lot of stuff and was starting to drift back to my self destructive ways and was having a hard time doing simple stuff and wasn't even motivated to come in any more, but that stripe reminded me to keep moving forward and working towards the next thing. The gym really is such an amazing thing for me on and off the mats. Thank you so much for everything it's really changed me for the better I can't wait to move up and progress towards the next step." There will never be a trophy or belt that can make me feel as proud as I do about the positive affect Straight Blast Gym of Niagara and our Brazilian Jiu Jitsu Program has on our members. For anyone that has ever been thinking of starting the beautiful art of Brazilian Jiu Jitsu, don't wait...jump in and reap the benefits. It will change your life for the better.